Contact Montana Goveror Steve Bullock urging him to support initiatives that welcome, respect and value native wild bison in Montana, and to abolish laws that empower the state's livestock agency to manage wild bison. Let him know you stand for protecting America's wild buffalo and our natural heritage. If you live out of state, let him know why you visit Montana and Yellowstone Country. If you are a Montana resident, express yourself! Urge Governor Bullock to show strong leadership by working not only to defeat efforts that seek to destroy our last wild buffalo and public wildlife, but to support initiatives that help naturally restore these gentle giants throughout Montana. America's wild buffalo (or bison) herds once roamed in the tens of millions from coast to coast, Canada to Mexico, but now only inhabit Yellowstone country, a mere fraction (.01 percent) of their historic range. Fewer than 4,000 wild buffalo exist and instead of being protected, they are abusively managed to serve Montana's cattle interests. 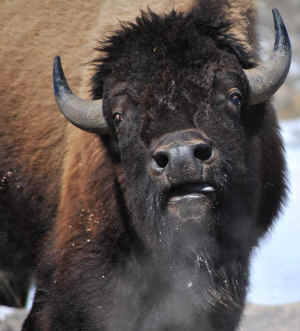 The wild, migratory bison of Yellowstone Country come into disasterous and unnecessary conflict when they migrate over the artificial boundary from Yellowstone National Park into southwest Montana. Montana's livestock interests, represented by the Montana Department of Livestock, have created and carried out tragic management policies against wild bison. For decades these practices have resulted in the indefensible, senseless deaths of thousands of wild buffalo, and repeated harassment and abuse of thousands more, all at U.S. taxpayer expense. Across the United States and around the world wild buffalo are a cherished, celebrated, honored animal, symbolizing the very spirit of wild, untamed North America. Recent polls have shown that Montana residents also overwhelmingly support wild, migratory populations of American buffalo in Montana, yet Montana livestock interests maintain absolute power over wild bison, making outlaws of these native gentle giants.